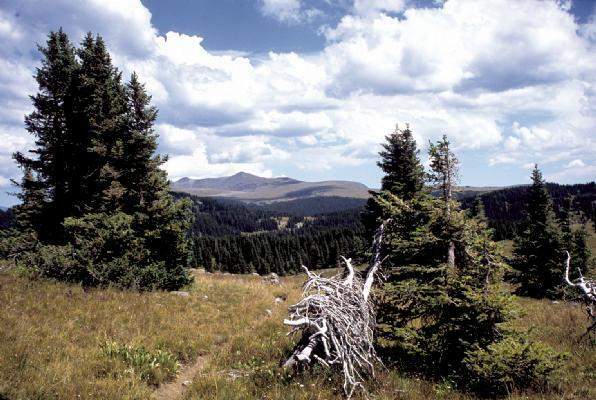 On the Fish Lake Trail there are magnificent views of Conejos Peak and other mountains as yet unnamed. PLATORO – Thirty years ago this fall, the last grizzly bear in Colorado was killed in the South San Juans. Supposedly. On the chance that a big bruin or two had been hiding in the remote wilderness all these years, a friend and I backpacked in late this summer to take another look. my strategy was to push my 6-foot-2 hiking buddy in front to stand by the bear and wave for perspective while I took a photo. Then I’d turn and run. Actually, I was even more afraid of collapsing under the weight of my backpack because it had been years since I’d shouldered it for such an extended hike. So I jettisoned extra gear, including a tent, and starting at Platoro Reservoir in Conejos County on the eastern side of the divide we hit Rito Azul Trail No. 721. That began the hike up to Blue Lake, the headwaters of the Navajo River, and some of the finest grizzly habitat in the lower 48 states. I’d read David Petersen’s excellent book Ghost Grizzlies: Does the Great Bear Still Haunt Colorado? and Rick Bass’ volume The Lost Grizzlies: A Search for Survivors in the Wilderness of Colorado. In Denali National Park, I’d seen grizzlies from the safety of a slow-moving school bus, and in the Weminuche Wilderness, I’d ridden horseback into La Rincon de la Osa, or the Hiding Place of the Bear near La Ventana, The Window. The last grizzly trapped in Colorado was killed there in 1952 in a place ironically named by the Spanish 200 years earlier. assumed it was the last. And it was, until another grizz showed up in 1979 – killed with an arrow under questionable circumstances by guide and outfitter Ed Wiseman, who claimed he caught an old sow in her daybed and, in self-defense, stabbed it with a hunting arrow. What really happened is hard to say. I figured if grizzly bears showed up every 20 or 30 years, it was time for an encore. So up the trail we went. The first day we hoofed it around Blue Lake, picked up the Continental Divide Trail, then left the smooth path with its stone cairns to drop over the edge into the headwaters of the Navajo River and high- country paradise. That first night I was so tired that if a grizz had come into camp, I’d have cuddled next to it and used it for a pillow. 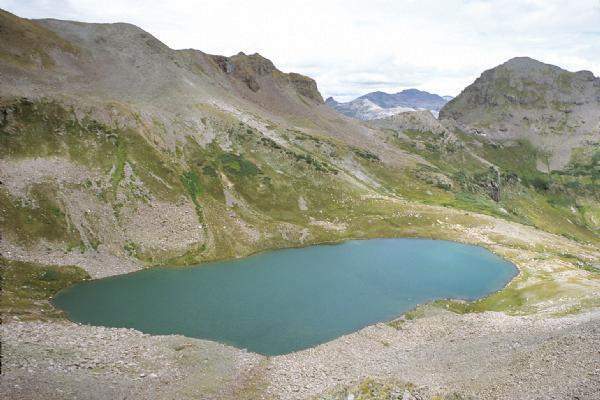 Deep in the heart of the 158,790-acre South San Juan Wilderness, on the second day we shifted from backpacks to daypacks and set out on Fish Lake Trail No. 574 in search of the wily grizz. At one time in Colorado, there were hundreds, if not thousands, of grizzly bears with nicknames like Old Clubfoot, Old Four Toes, Old Saddleback and Old Mose. To this day, you’ll find dozens of place names such as Grizzly Creek and Grizzly Peak. Even after the “last” grizz was killed in 1979, big- bear sightings continued. Reid adds, “Some hikers and hunters think they’ve seen a grizz because they’ve spotted a large brown bear. The remaining Colorado bear species is a black bear, but in our state the largest number of black bears are brown in color – like chocolate or cinnamon. My friend and I hoped to see a slow-moving brown lump with a dished or flattened face, a distinctive hump, and tracks made from long claws. Instead, we saw miles of mountains, clear Colorado blue skies and perfect habitat for grizzlies. Without tents, we huddled under pine trees as the storm moved on. 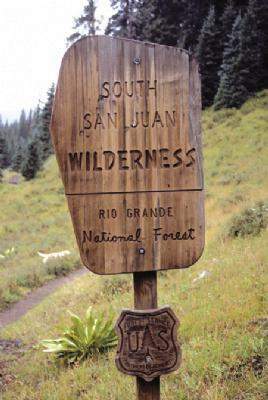 The next day we crested the pass, hiked along the rim to look down into the turquoise waters of Lake Ann and, at one point high on the divide, looked northwest into the awesome jumble of pines and cliffs that is the head of the Blanco River basin. “Down there” we said. If there’s any grizz left in the state, they must be between the headwaters of the Navajo and Blanco rivers in some of the wildest, most remote country we’d ever seen. I’d like to tell you I dreamed of grizz on our last night in the wilderness. I’d like to say that as we hunkered down in the dark pines like wet trolls for another rainy night, our dogs howled and a huge shape slipped through the trees. But no bears came. After 26 miles of backpacking we’d seen awesome country, but no grizzlies. Still, they could be there. history at Fort Lewis College. ""Some hikers and hunters think they've seen a grizz because they've spotted a large brown bear.""